Set against the backdrop of the real history of Carnton Plantation in Franklin, Tennessee, Christmas at Carnton is a story of hope renewed and faith restored . . . at Christmas. Well, it seems to be that time of year again: Christmas-themed books are hitting the shelves, preparing readers for the impending holiday season. 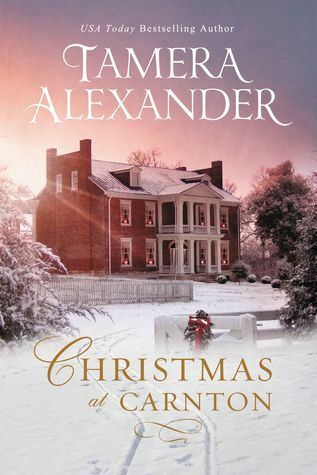 My first holiday read this year, Christmas at Carnton by Tamera Alexander, proved to be a delight, a perfect start to the season. This novella introduces the setting for Alexander’s new Carnton-based series. At the heart of a holiday fundraising and morale-boosting event, the grand plantation brings recently widowed and evicted Aletta Prescott and injured Confederate soldier Jake Winston together and fosters a seemingly impossible relationship amidst the Civil War’s devastation and loss. It’s a sweet story that unfolds as the two accept their realities and embrace their possibilities. It doesn’t feel rushed, though a lot of emotion and growth squeezes into a short amount of time, but I did miss seeing some of the relationship development that occurs between scenes. For readers eager to begin their holiday reading, look no further than Christmas at Carnton. It’s full of the season’s hope and faith despite uncertain circumstances, and I recommend it. Thanks to BookLook Bloggers, I received a complimentary copy of Christmas at Carnton and the opportunity to provide an honest review. I was not required to write a positive review, and all the opinions I have expressed are my own.